This seemingly seasonal sidewall was conceived by American designer Janet Hart White for Basset & Vollum, Inc. in 1953. Polygonal shapes of various sizes are outlined in black and scattered across a cream colored ground. Hexagonal medallions in bright blue and green highlight the intricate radial patterns contained within the polygons. For most of us, ‘snowflakes’ will be the first association that comes to mind when viewing this atomic-age sidewall, but for students of molecular structure White’s design might perhaps trigger the thought “X-ray crystallography.” X-ray crystallography is a method of creating diagrams of the microscopic structure of crystals. When the UK-based Council of Industrial Design was looking for innovative ways to expand the field of pattern design in the years following World War II, crystallographer Dr. Helen Megraw proposed using the diagrams obtained through X-ray crystallography as inspiration. The council thought this was a swell idea, and commissioned several manufacturers to produce designs based on crystal structure for the 1951 Festival of Britain. Wallpapers drawing on images of insulin, boric acid and other molecules were included as part of the London-based exhibition, and a pamphlet called The Souvenir Book of Crystal Designs was published to commemorate this new group of patterns. Though White’s wallpaper does inarguably resemble the retro snowflakes from the Chuck Jones version of The Grinch who Stole Christmas, when viewed in the context of the Festival of Britain wallpapers this pattern becomes a bit more perennial. Whether her crystals are inspired by H2O or some other molecule, what they really represent is the great success that can result when professionals from seemingly disparate disciplines like X-ray crystallography and wallpaper design take the time to collaborate. Anna Rasche is a master’s student in the Cooper Hewitt Parsons History of Design and Curatorial Studies Program, and is a Master’s Fellow in the Wallcoverings Department. 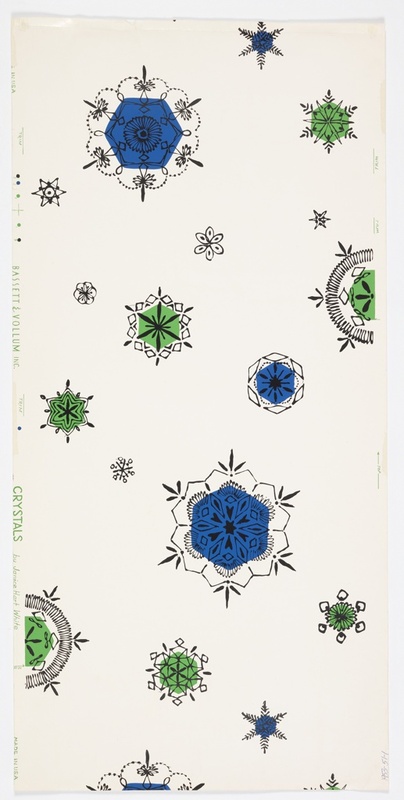 Sidewall, Crystals, 1953. screen-printed on paper. Gift of The Wallpaper Magazine. 1953-51-1.